Junk Car Tip of the day: One of the most common ways to turn your beloved vehicle into a junk car is to neglect the cooling system. Owning a vehicle comes with the responsibility of taking care of it long after you drive off the dealership lot. This means investing time and money into caring for your car, regularly changing the oil, rotating the tires, and replenishing fluids. Keeping up with your vehicle’s preventative maintenance schedule is smarter and more affordable than waiting until more costly repairs are needed down the road. One aspect of preventative maintenance you may not know much about it radiator upkeep. There are certain steps you can take to help maintain a properly functioning radiator. Understanding more about the radiator itself and a few basic tips can save you time, money and a big headache in the future. The radiator is the key component in your engine’s cooling system. The cooling system keeps your engine from overheating, which prevents internal components from melting, melding together, and causing your car to malfunction. It is no exaggeration to say that your cooling system is a component that prevents total engine failure. The radiators crucial role within the cooling system is regulating the temperature of the engine. It keeps the car from overheating on simple drives and well as keeping it functional on very cold nights. You don’t want to see your radiator fall into disrepair, of course, but what can you do to stop it from doing so? Keep the coolant, or radiator fluid, filled at all times. You should always administer coolant with a 50/50 water mix, or purchase an already watered-down version from your local auto supply store. Keep the radiator cap on tight; it’s designed to keep the entire coolant chamber pressurized. Has your radiator cleaned out a couple of times each year? To save some time and also make it easier to remember, you can have this service performed whenever you take your vehicle in for a tire rotation or oil change. Have your radiator flushed and filled on an annual basis. This is another service you can have done by your local trusted technician. How Often Should You Flush Your Radiator? The frequency of when radiator flushes should be performed varies by vehicle. Most cars typically require this service annually. In some cases, for those who drive their cars pretty heavily throughout the year and rack up a lot of miles, additional flushes may be necessary. This is something that your auto technician can help advise when you’re at the shop. Flushes are required to rid your radiator of particle buildup and prevent clogging. If recommended flushes are not performed, this buildup can spill throughout the entire cooling system. The results can be degradation and wearing down of the cooling system while preventing it from functioning properly. Always remember to change your oil regularly.. If you don't...well...just keep us on speed dial. What Can Make a Motor Throw a Rod? Back in the day, "throwing a rod" in an automobile engine was far more common than now. In modern engines that are properly maintained and not abused, a thrown piston rod in normal driving conditions has become extremely uncommon. Nevertheless, when it happens, it's a catastrophic event that usually requires a major overhaul, if not an entirely new engine. 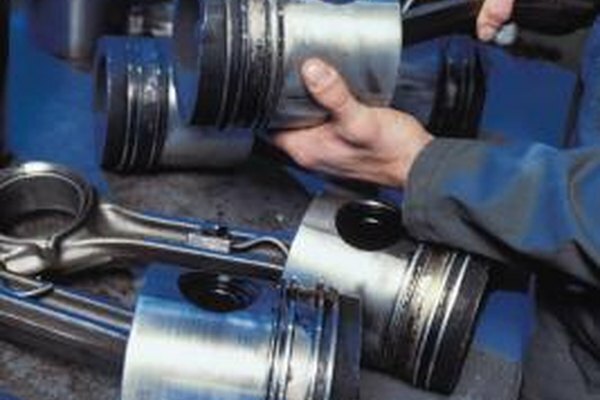 A piston rod is "thrown" when it separates from its connection point, whether at the piston pin at the top of the rod or at the bottom of the rod where the rod bearing attaches to the crankshaft. Conditions leading to a thrown rod aren't subtle or multifaceted. In most cases, the causes of a thrown rod are limited to a few major failures. There are only two reasons why an engine would have oil pressure low enough to throw a rod. Excessive wear in very high-mileage vehicles can systemically lower oil pressure enough to cause a rod bearing to spin out of its bearing cap on the crankshaft due to friction from lack of lubrication. When this happens, the rod detaches from the crankshaft and, depending on whether it occurs on the upstroke or downstroke, either smashes the liberated piston into the cylinder head or knocks a hole in the engine block. The other reason for low oil pressure is, well, no oil in the crankcase. A warning light on the dashboard should let you know when things get that desperate. An oil pressure gauge to give you a continuous readout is a better early warning device. Checking your oil regularly--even better. Over-revving an engine beyond its engineered limits can cause the rod, bearing or wrist pin to fail from excessive stress and heat. This is difficult to do in the average vehicle with standard factory setup because most have "rev limiters" to prevent it. But engines modified for competition or even just high-performance street operation are capable of putting the rpm's far enough into the red for long enough to spontaneously shed internal components. A broken intake or exhaust valve may drop into the piston cylinder. If the engine continues to run, the loose valve wreaks mechanical havoc in the cylinder, pulverizing the head of the piston and resulting in a thrown rod from breakage at the wrist pin. Connecting rod bearings that attach the piston rod to the crankcase are enclosed in caps secured with highly-torqued nuts and bolts. Conceivably, any nut and bolt screwed together can loosen with age or if they aren't properly tightened to begin with. It's definitely not the first thing to suspect, but once in a while, those nuts work loose and release the bearing which then throws the rod. It can also happen if someone rebuilding an engine opts to reuse the previous bearing cap bolts and nuts which have already been overstressed by torquing and age. New rod bearings should always be installed with new hardware.